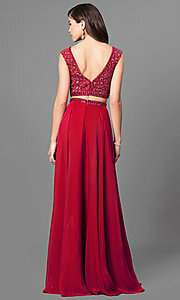 Look stylish as ever in this long two-piece embellished prom dress by Sherri Hill. The exquisite designer evening dress boasts an intricately embellished bodice and sweeping chiffon skirt for a look that shimmers from top to bottom. Setting the tone for the trendy design, the bodice of the two-piece prom dress features a bateau neckline and an attention-grabbing v-back. Beads and rhinestones illuminate as the crop top sparkles at every turn. 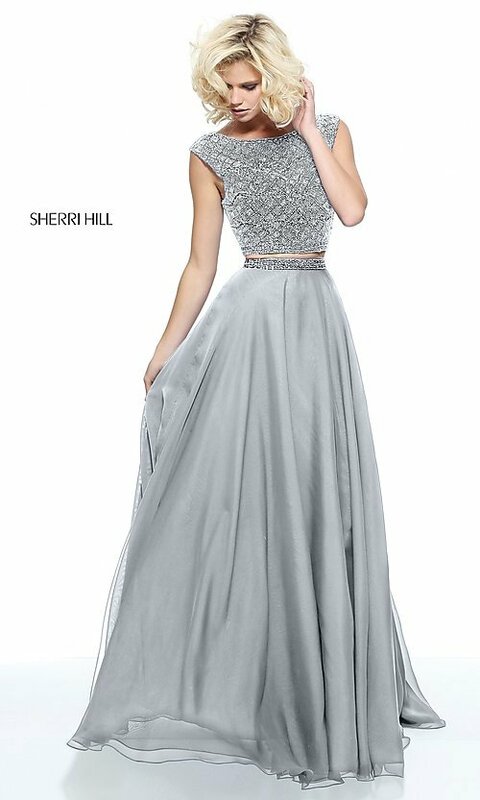 Glimmering details wrap the waist with a bold band that highlights the midline and crowns the long graceful chiffon skirt finishing off this Sherri Hill prom dress with style.